Those highly sensitive to digital technology tend to block out traditional advertisement and gather information from social networking services and blogs. 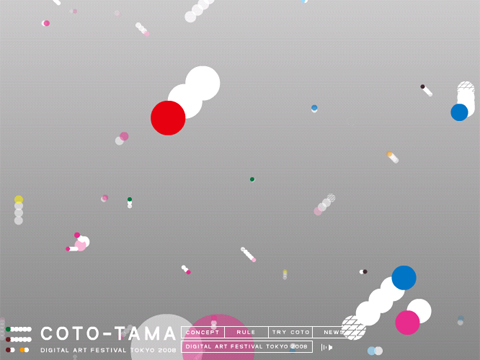 We developed “COTO-TAMA” in order to have them come to Digital Art Festival. Messages that are usually only in form of digitally typed words or digitally recorded messages, were in the form of 50 syllables with individual souls. Users communicate with each other through this widget and naturally created a community of digital art fans. At the same time, we used this widget as a direct marketing tool to convey messages to our target.